The cooperating faculties of San Diego State University (SDSU) and the University of California, San Diego (UCSD) offer a joint doctoral program (PhD) in Language and Communicative Disorders. The program’s focus is the interdisciplinary study of language and communicative disorders. A major emphasis of the program is to apply techniques developed in cognitive science and neuroscience to the study of language and language disorders. The program involves study and research on typical and atypical language acquisition and development, sign languages, bilingualism, and the neural bases of language use and language loss. As such, this interdisciplinary program draws from a variety of undergraduate disciplines including communicative disorders, psychology, cognitive science, linguistics, engineering, and other related sciences. The program, the only one of its kind in California, was ranked fourth on the Faculty Scholarly Productivity Index rankings compiled by Academic Analytics and released by The Chronicle of Higher Education in 2007. The National Research Council (NRC) ranked our doctoral program among the top ten in the nation in their most recent rankings (2010). In 2008 our program at SDSU moved into a new clinical, research, and academic building with state-of-the-art Speech-Language and Audiology clinics, high-tech labs, and instructional facilities. These resources, combined with the outstanding facilities at UCSD, provide doctoral students with the best possible training environment. The program is innovative in that many of the requirements are designed to function as a model of professional preparation specifically incorporating activities in which a successful teacher and researcher must engage after obtaining the Ph.D.: students are required to participate in interdisciplinary research throughout the program, learn about the nature and ethics of research, prepare grant proposals, write manuscripts, and gain experience in oral presentations and teaching. Graduates of the program are well prepared for the rigors of an academic/research career. They are qualified to serve as faculty in a variety of disciplines, and to provide leadership in teaching, research and health services. 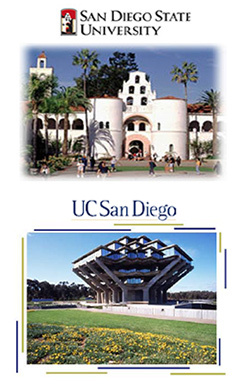 See the faculty page for the list of constituent faculty at SDSU and UCSD. The faculty have research interests in a wide range of issues in processes of language development, language and aging, multilingualism, language disorders, assessment, and intervention.